This news story calls to mind myriad episodes in the history of the Church. So many in the past have tried to “teach” the Church a lesson. The enemies of the Church never seem to learn. This has been the consistent behavior of communists throughout their brief and despotic history. They have long dreamed of controlling the Catholic Church by forcing Church authorities to submit to their perverse communist ideology. However, such “lessons,” have frequently had the opposite effect. The famous observation of Tertullian, “the blood of martyrs is the seed of Christians,” shows how when the Church is persecuted, it only serves to make Her thrive. This was the lesson the Romans learned when they tried to suppress Christianity. It seems quite evident that in China, Cuba, Vietnam and North Korea, there is only one lesson that is taught: submission to communist authorities. They would do well to learn that the lessons of history are different. 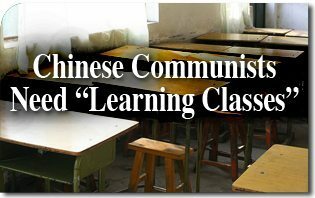 Chinese communists would profit by “learning classes” of another sort. There they would learn that in the end, the Church always prevails and they will be just one more of the many enemies that have been defeated by Her. This entry was posted in News Commentary and tagged America, Asian, bishop, Catholic, Chancellor, China, Chinese, Christian, Church, class, classes, Coadjutor, commentary, communist, Cuba, enemy, Father, government, ideology, Jiang, martyr, news, North Korea, patriotic, persecute, Peter, Shao, TFP, underground, union, Vietnam, Wenzhou by Gary Isbell. Bookmark the permalink.